Can I setup a Microsoft 2 node SQL 2008 failover cluster using 1 ESXi 5 server? I have only 1 ESXi 5 Server. I would like to setup a Microsoft SQL 2008 failover cluster using 2 VMs (Server 2008 Ent, running Microsoft Cluster Service and SQL 2008). Is this possible with just one ESX host server? If so what are the steps to set this up? I have a lab environment in which to test I just need someone to point me in the right directing. Thanks! Yes, it's called Cluster in a Box, two VMs on an ESXi host, using Shared Virtual SCSI Adaptor. Thanks for your help! Always a good experience. 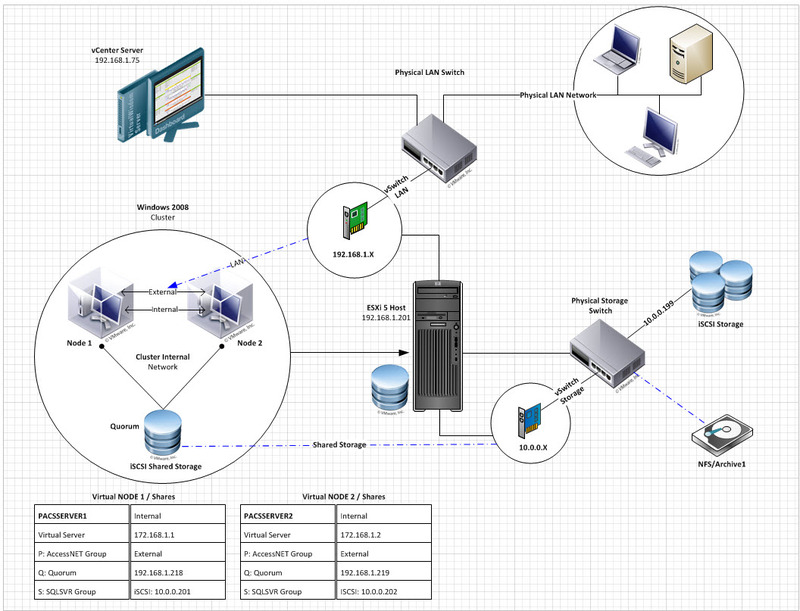 Hanccocka, this is the visio drawing to the solution I am looking for. I will put this together and followup with you on how it turned out. If you see anything that I am leaving out on the diagram I welcome your comments and suggestions. Thanks!